As a doula I practice my breath every time I attend a birth, (like all moms I should practice it everyday instead) As each surge comes I inhale with that mama and tell her to pause, that “pause” is their strength and their love and as they exhale they let go of one more surge bringing them closer to their baby. That breath is there for moments of traffic, ear aches, work deadlines, book fairs, burnt dinners and endless nights with early mornings. The “pause” as we allow that oxygen to go to our tight muscles and stressed brainwaves tells us we are in control, we are capable, we are strong, we are love and deep down we know we are Loved. 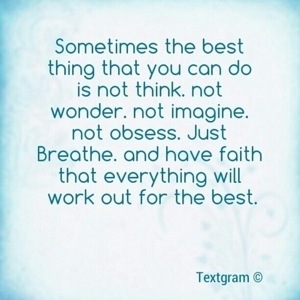 Let go and take one more breath. Joy is all around us. This entry was posted in Uncategorized and tagged Birth, breathing, doula, HypnoBirthing, parenting. Bookmark the permalink. If this chakra isn’t working correctly it negatively influence the legs, bones, adrenal glands, colon, kidneys and spinal column.